A special thanks goes to Norman Critchett for a very interesting demonstration showing the magic of how to put ships and indeed other items in bottles. He kept the group spell bound for about an hour and a half with his informative and entertaining demonstration. See the gallery for some photos. After a thorough discussion of the draft constitution presented to the members at the previous meeting it was formally adopted by a unanimous vote with one small addition. The full constitution is available to view in the members' area. The adoption of the constitution together with the bank account which has now been opened and the steering committee in place, completes the formation of the Colwyn Bay Men's Shed. There was also a unanimous vote of confidence in the existing steering committee which allows that committee to continue on its path of arranging meetings and searching for funding and premises for the group. The meeting of 23 May went ahead as planned with the draft constitution being presented to the members. The plan is for it to be voted on at the next meeting so that it can be adopted. We are currently recruiting members to the Colwyn Bay Men's Shed and if you would like a membership application form please download one here. Also, arrangements have been made for a group visit to the Rhyl Men's Shed in Tuesday June 3rd. 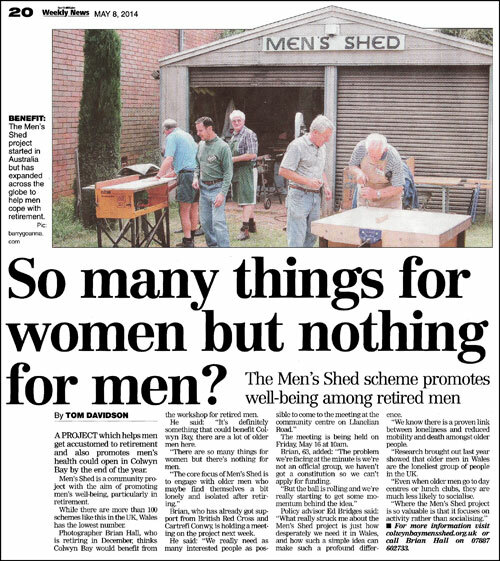 This will give people an opportunity to see what an established Men's Shed is like and what the guys there get up to. If you would like to go (transport from Colwyn Bay is to be provided) please speak to Megan at the Friday meeting. At the Meeting of the Colwyn Bay Men's Shed on Friday 16 May an appeal was made for volunteers to make up a steering committee to guide the project in its early stages. Four volunteers came forward and have formed the said steering committee. That committee met on Tuesday 20 May and has prepared a draft constitution to be presented to members on Friday 23 May. Interest in the Colwyn Bay Men's Shed is growing fast as each day goes by and we have now, with help from Cartrefi Conwy, organised a series of meetings to move the project forward. These meetings are due to start on Friday 16 May 2014 at the Pentre Newydd Community Centre, Llanelian Road, Old Colwyn, LL29 9UG and will initially run from 10:00am until noon. 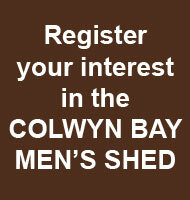 Please make every effort to attend and become a part of the Colwyn Men's Shed Shed from the beginning. Further details will be announced on this page just as soon as possible but please register your interest to be kept fully up to date with progress.